Round Valley Regional Preserve is located in the Mt. Diablo foothills on the east side, between Antioch and Livermore. My cousin and I took our mountain bikes there to tackle two unnamed summits outside the preserve to the north and northwest. It's a fairly long drive from San Jose, though not as far from his house in Pleasanton where I stopped to pick him up on the way. We got to the trailhead off Marsh Creek Rd before 10a and were off and riding by the top of the hour. The trailhead was surprisingly busy for an out-of-the-way place during mid-week. 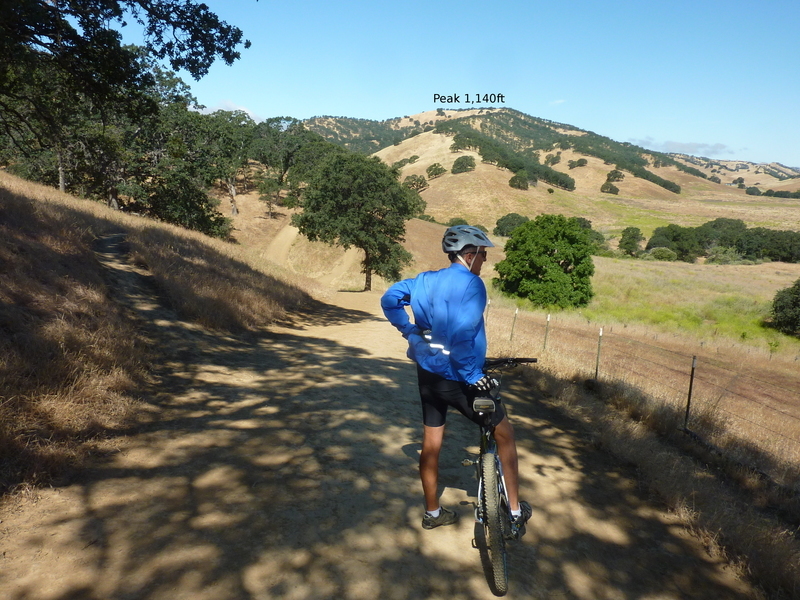 We rode across the bridge at Marsh Creek (all but dry now) and took the Miwok Trail west for about a mile and a half. There are numerous informal single-track trails that have been beaten into the dry, grassy hillsides over the years. These roughly parallel the Miwok Trail (a decommissioned ranch road) and make for fun alternatives. At Round Valley we reached a junction and followed the north fork towards the park boundary. We got sidetracked on another single track that took us off the main roadway and up a dry creek where it eventually petered out at the boundary. We lifted the bikes over a barbed-wire fence here, crawled under ourselves, and then made our way back up to the main roadway, now outside the park. A little-used ranch road branches off to climb the ridge to the east, the highpoint of which is Peak 1,140ft, our first stop. Only some of this steep road could be ridden, party due to the gradient, but mostly because the road itself is terribly rough and bumpy - not much fun for riding at all. Once atop the ridge where views open up nicely, we road SE another half mile to the highpoint, arriving an hour after starting out. The highest point is just off the road under a stately oak in the tall grass, now brown and full of stickers. My brief foray of some 20ft to visit it would cost me some time to remove the stickers I picked up.